He has commissioned and recorded music from many of today’s leading composers, featuring on his own solo CD (Towards the Light 1998), with the Equivox Trio (The Time is Now 2006), eight CDs with the Apollo Saxophone Quartet (of which he is a founder member), and a recording of commissioned concertos with the RNCM Wind Orchestra is planned for 2009/10. He regularly performs and records with such diverse ensembles such as the Michael Nyman Band, (Rob recorded with the MNB on the new CD with David McAlmont – tipped for the Mercury Prize 2009) Halle Orchestra, Royal Liverpool Philharmonic Orchestra, BBC Philharmonic, BBC Concert Orchestra, Opera North and Northern Sinfonia, and recently performed on TV as part of the band for ITV’s “Soapstar Superstar”, and as part of the stellar Royal Variety Performance Orchestra (2007 and 2009) backing artists such as Jon Bon Jovi, Kiri Te Kanawa, Chaka Khan, Lulu & Anastacia, Michael Buble, Bette Midler and the casts of Sister Act and Hairspray. Uniquely in demand as both classical soloist and jazz artist, Rob also regularly works with Sax Assault (Andy Scott’s 12 piece Saxophone jazz funk group), the John Wilson Orchestra, Keith Nichol’s various early jazz projects, the Apitos Latin Big Band and his own jazz group, and can regularly be heard performing on Film and TV soundtracks. In recent years, Rob has been heard performing in concert with artists as diverse as Wayne Shorter, Ringo Starr, Kiri Te Kanawa, the BBC Big Band, and the Wombats, and was recently featured saxophone soloist with Elvis Costello’s new orchestral project, which will hopefully tour the USA and Europe in 2010. 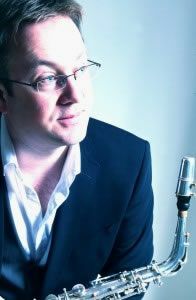 Rob has spent a significant proportion of his time over the last 25 years performing with the Apollo Saxophone Quartet, a world class ensemble that is widely acknowledged as one of the UK’s finest contemporary chamber ensembles. Following early successes in the Royal Overseas League, Park Lane Group, Tunnell Trust, Countess of Munster and Tillett Trust competitions in the UK, and successes overseas in the Erasmus Competition in Rotterdam and the Tokyo International Chamber Music Competition, the quartet established an unrivalled reputation throughout the UK, Europe and Japan at Festivals and concert venues, and now records and tours extensively both in the UK and abroad. The ensemble has commissioned over 100 new works from some of today’s finest composers, such as Michael Nyman, Michael Torke, Richard Rodney Bennett, Graham Fitkin and Django Bates, creating the new core repertoire for the medium. As a composer, Rob writes and arranges for film, tv and media, with several of his works featured on recent adverts, he has written a highly successful and popular ongoing series of original compositions for young players (solos, duets, quartets and pieces for Saxophone and Piano), many of which are now part of the Associated Board, Trinity and Guildhall syllabuses (published by astute-music.com). Rob has recently also composed works for the RNCM Saxophone Orchestra, Sax Assault, the Equivox Trio, a new CD’s worth of original jazz charts for his new jazz ensemble, and is currently writing a new saxophone study/method book. Alongside his busy performing schedule, Rob is Professor of Saxophone at the Royal Northern College of Music in Manchester, where, since 1997, along with Andy Scott, he has established the UK’s largest and most active Saxophone programme. He was awarded Fellowship of the RNCM in 2008, in recognition of his work with the RNCM saxophone Department, the saxophone in general, and pioneering new music performance. In addition to his teaching commitments, he has conducted the RNCM Saxophone Orchestra in concerts in Berlin, (at the first European Saxophone Orchestras Convention), British Saxophone Congress in Cardiff, and at venues throughout the UK. He has recently been appointed Saxophone Consultant at Chetham’s School of Music in Manchester, runs his own International Saxophone Summer School, and the Harrogate Saxophone Summer Course, is frequently asked to present saxophone weekends and days throughtout the UK for saxophonists of all levels, and regularly appears as guest coach on summer schools and course throughout the UK. He is co-Artistic Director (with Andy Scott) of the RNCM Saxophone Day, now the UK’s largest annual saxophone event. Rob is a Henri Selmer Paris artist, and endorsee for Vandoren Reeds.